You are currently browsing articles tagged ESV. The PCA Historical Center actively collects, funds permitting, published histories of Presbyterian churches. There is a great deal of history too often overlooked in these volumes. In particular, good and encouraging words are often to be found on the opening pages of these histories. Anniversary occasions should be times of great joy. Songs of praise and gratitude should be heard as we celebrate our religious birthdays. Although the sorrowful is mingled with the joyful, as we regret out mistakes and mourn over the beloved fellow-workers now gone to their reward, yet we can rejoice in the Lord as we meditate upon His loving kindness and tender mercies toward our Church. This retrospect should also strengthen our trust in God as we trace His leadings and blessings, for we become more assured that He who has guided us in the past will not neglect us in the coming days. Our history can also be read for encouragement and inspiration, as we trace the humble beginnings of religious work in this community up to our present attainments. Our eyes are so often turned to the future that we sometimes forget that much can be learned from the past. Every church ought to have its history clearly and fully written so that every member may make no mistake by overlooking certain well defined facts which enter into the individual character of that particular church. As we, therefore, glance over the past and trace God’s goodness in our Church’s growth, may this view increase our trust in God, our regard for each other and our zeal for the future. But let us turn the pages of our history with a sense of humility rather than of self-glory. We are not to bring before us figures and comparisons to feed our pride and conceit, for our progress has been owing to Divine grace and goodness, and not wholly dependent upon our faithfulness and zeal. God often uses the weak things of this world to confound the mighty, so that there is no need of boasting. As we become somewhat encouraged over the retrospect and prospect, let us remember our own mistakes and neglects. If we, as members of this Church, had been more faithful, liberal, devout and earnest, would we not have accomplished greater results than we now behold? But we cannot alter the past. We can only read the facts as history–“time’s slavish scribe”—records them, and allow them to make their own impressions upon us. 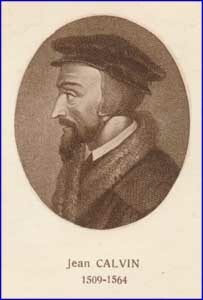 An excerpt from Selected Works of John Calvin: Tracts and Letters, edited by Henry Beveridge and Jules Bonnet (Baker, 1983), vol. 7, p. 183. “. . . I come now to your letter, which was lately brought to me by a pious brother who has come here to pursue his studies. I rejoice exceedingly, as you may easily suppose, that the gospel has made such rapid and happy progress among you. That they should have stirred up violent opposition against you is nothing new. But the power of God is the more conspicuously displayed in this, that no attacks either of Satan or of the ungodly have hitherto prevented you from advancing with triumphant constancy in the right course, though you could never have been equal to the task of resistance, unless He who is superior to all the world had held out to you from heaven a helping hand. With regard to ceremonies, I trust, even should you displease many, that you will moderate your rigor. Of course it is your duty to see that the church be purged of all defilements which flow from error and superstition. For it behooves us to strive sedulously that the mysteries of God be not polluted by the admixture of ludicrous or disgusting rites. But with this exception, you are well aware that certain things should be tolerated even if you do not quite approve of them. I am deeply afflicted, as you may well believe, that the nobles of your nation are split into factions, and it is not without reason that you are more distressed and tormented, because Satan is now plotting in the bosom of your church, than you were formerly by the commotions stirred up by the French. But God is to be intreated that he may heal this evil also. Here we are exposed to many dangers. Nothing but our confidence in the divine protection exempts us from trepidation, though we are not free from fears. In September of 1774, the first Continental Congress met in Philadelphia to protest some British laws which were deemed to be injurious to the people of the American colonies. One of them had been to deem all territory north of the Ohio River to Quebec, a Roman Catholic province. With that protestation, these early risings of independence sent petitions to their British rulers, urging at the same time that the people of the colonies take action by boycotting certain British goods. All over the colonies, committees came together to discuss their collective responses to this call. On January 20, 1775, a group of people representing southwest Virginia, met in the town of Abington, Virginia. A committee was formed, made up primarily of Presbyterians in two churches pastored by Charles Cummings. Their names deserve to be mentioned, as they were the key Presbyterian laymen of that area. They were, along with their rank, Colonel William Christian, Colonel William Preston, Captain Stephen Trigg, Major Arthur Campbell, John Montgomery, James McGavock. William Campbell, Thomas Madison, Daniel Smith, William Russell, Evan Shelby, and William Edmundson. Here was no wild-eyed statement of revolution, but rather a carefully formulated statement of subjection to lawful authority, as long as the latter did not seek to take away the rights and privileges of its citizens, and thereby make them little more than slaves. It was thought that the wording of this declaration was essentially that of Presbyterian pastor Charles Cummings. They were sent to the Second Continental Congress as the spirit of southwest Virginia with regards to the important issues of liberty and justice for all. Last year, we would occasionally defer to a short study of one of the catechisms when otherwise lacking something to write about. Better equipped this year, that is rarely the problem now, but, full of turkey left-overs, and needing a break, for this November 30, we go back to a post where we considered two questions and answers from the Larger Catechism, on the Sacraments of Baptism and the Lord’s Supper. Question and answer 176 reads: “Wherein do the sacraments of baptism and the Lord’s supper agree? Question and answer 177 reads: “Wherein do the sacraments of baptism and the Lord’s supper differ? Both of these questions would be great questions to ask potential officers of our churches, including those who would seek to be pastors in our presbyteries, for they require an overall understanding of baptism and the Lord’s Supper. Indeed, they are an excellent teaching tool for the Christian parent to prepare the children for church membership. There are five areas of agreement between the two sacraments. For both, the author is God. Christ and His benefits are represented as being instituted. Both are seals of the covenant of grace. Both are church sacraments. And both are to be practiced until we see Christ in the flesh at His second coming. The differences are simple and understandable. The outward elements are water, in the one, contrasted with bread and wine in the other sacrament. Then too, the timing of Christ’s benefits to the believer differ, in that baptism speaks of the beginning of the Christian life, while Communion speaks of its continuance. Baptism is to be done once and not repeated. The Communion is to be done often. Baptism includes infants while the Lord’s Supper implies the ability to discern the elements. The assessment was made by a fellow minister that nothing would come from the beginning church, that it was not likely to increase in the city. How that minister was wrong, for the Lord was behind this first church and He was also using the missions-pastor to grow the church. 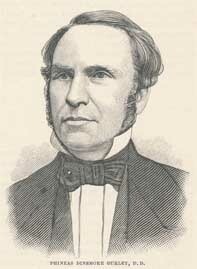 Jedidiah Andrews was one of the seven Presbyterian ministers who began the first Presbytery in Philadelphia. He was the only one who had been born in the future United States of America. Born on July 7, 1674 in Higham, Massachusetts, Jedidiah went to Harvard College, and graduated in 1694. Moving to Philadelphia three years later, and already ordained in the gospel ministry, he began to preach in a building in cooperation with the Baptists in that city. However, the arrangement did not last long, through an oversight of a meeting day by Mr. Andrews. The Baptists were offended at that, with the result that the cooperation was hindered between the two churches. That bought about the assessment by the Baptist minister which was found in the first sentence of this historical devotional. But God was in the picture now, and the Presbyterians did grow after they built their own structure on Market Street between Second and Third Street in 1704. For years, in fact, it was the only Presbyterian church in Philadelphia. In 1706, Jedidiah Andrews and six other ministers raised up the Presbytery of Philadelphia, the first such organization in the colonies. From day one, Rev. Andrews was the recording clerk of the Presbytery, and later of the Synod, until his death in 1747. Jedidiah Andrews had a missionary heart. Frequently, he went on preaching tours in Pennsylvania and New Jersey. The nuclei of many a congregation was formed by him during those years. He felt a burden for the care of the churches. Words to Live By: Pray this day for your pastor. Having been one for 38 years, this contributor knows something of the cares of the church which press upon your shepherd of the sheep. Go to him and ask him to give you in general, the duties of his work week. Then tell him that you will remember him regularly in those duties. That will greatly encourage him to keep on keeping on in the work of the gospel, and the growth of the congregation, both in spiritual and temporal growth. The memorial service in the East Room of the White House began with the solemn reading of Holy Scripture by the Presbyterian clergyman. Dr. Phineas Gurley, pastor of the New York Avenue Presbyterian Church in Washington, D.C. obviously wished to set the tone of God’s place in this whole tragedy. What was that tragedy which prompted their gathering on April 19, 1865? Nothing less than the assassination of the President of the United States, Abraham Lincoln.